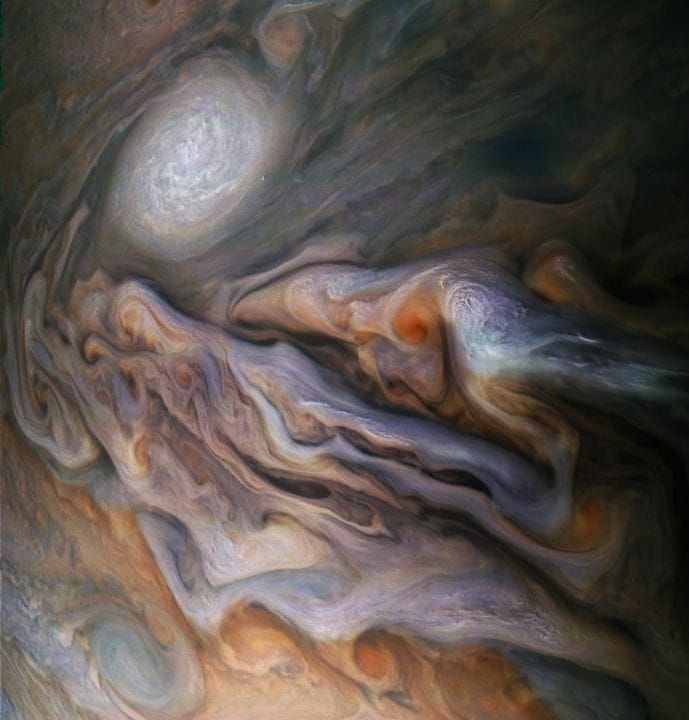 11.08.18 JOVIAN CLOSE ENCOUNTER A multitude of magnificent, swirling clouds in Jupiter’s dynamic North North Temperate Belt is captured in this image from NASA’s Juno spacecraft. Appearing in the scene are several bright-white “pop-up” clouds as well as an anticyclonic storm, known as a white oval. This color-enhanced image was taken at 1:58 p.m. PDT on Oct. 29, 2018 (4:58 p.m. EDT) as the spacecraft performed its 16th close flyby of Jupiter. At the time, Juno was about 4,400 miles (7,000 kilometers) from the planet’s cloud tops, at a latitude of approximately 40 degrees north. Citizen scientists Gerald Eichstädt and Seán Doran created this image using data from the spacecraft’s JunoCam imager. JunoCam’s raw images are available for the public to peruse and to process into image products at: https://www.missionjuno.swri.edu/news/jovian_close_encounter. Image Credits: NASA/JPL-Caltech/SwRI/MSSS/Gerald Eichstädt/Seán Doran. Απολαύστε το φως.